** 18 pass, min 5 hrs, 20% srv chrg & tolls extra, limited to local area. Other restrictions may apply, call for details. Arrive at your wedding destination in style in one of our high quality wedding limos. We have a large selection of affordable limousines available to suit most budgets. We have helped many happy couples start off their special day in our luxury vehicles. We have the experience, all the right prices and different vehicles for a special wedding celebration. From a small to a large wedding party, find the right limo or party bus from our extensive fleet. We offer white, silver and pink stretch limos and up to 50 passengers party buses. Call now to get a custom wedding limo and party bus package quote! Visit limo and party bus wedding rates page . Bergen Limo are a popular provider of luxurious limousine airport transfers. We will collect you from home, work place or hotel and take you to your airport in plenty of time for you to catch your flight, stress free. We have a large fleet of newer and well-maintained limos which are all comfortable and clean. Receive affordable rates when traveling to LGA (LaGuardia, NY), EWR (Newark, NJ) and JFK from North NJ area. Book now and always receive a safe and fast service for small / large groups. Call or visit our Limo and Airport Car Service page for more details and pricing information. We have the best fleet of affordable party buses in the New Jersey and New York areas available for hire. We won’t be beaten on price and will price match other professional NY and NJ party bus providers as long as they offer comparable party buses in size and quality. Our goal is to provide you with the best party bus rental experience for a fun night out, prom, wedding, birthday and more. Call Bergen limo now and let us take care of your needs so that you have a safe and fun time. Find out more about our party bus rental services and view our fleet. Located in North NJ, Bergen Limo specializes in offering ground transportation services and a large variety of limo rental packages throughout New Jersey, New York, Connecticut and Pennsylvania. We have been in the industry since 1994 and we continue to aim on improving and providing our customers with cost-efficient and reliable car or limousine transportation services for your special event. You can expect wide options & different packages to match your transportation needs such as for Antique Cars , Party Buses and SUV rentals. Brand New Bus up to 44 Pass with up to 44 bags. Take advantage of this special offer available for $8000.00. Non stop 2 drivers to Orlando, service in Florida includes up to 12 hours of service per day. Bus to Disney Word, bus to Universal Studio, bus to Theme Parks, bus to Sea World. Bergen Limo meets your expectations and budget for prom related services. Our limousine packages are available and perfect for proms in New Jersey and New York areas. We only work with professional team who will guide and help you on choosing the ideal vehicle for your prom in order to make it a night to remember. We offer a range of affordable prom limos and we rely on very high standards when servicing our customers, especially teenagers. This will guarantee that you and your family are in good hands when attending one of your memorable events in life. When choosing wedding limousine, our professional representatives here at Bergen Limo can help you choose wisely. Just visit our fleet page or go to our showroom office located in New Jersey, and take a sit with our representative to decide the best wedding limousine to be used on your special and memorable day. We will make sure that it fits your transportation needs as well as your wedding day party. When you choose from our special selected packages here at Bergen Limo, you can enjoy complimentary champagne, different kinds of soft drinks, bottled water and many more. Additionally, most of our offers for wedding packages are packed with 1 or 2 Free Hours. So call us now and find out how we can help you make your wedding day more special with our wedding vehicle packages. No doubt that large events will surely need large transportation for accommodation. Make your event more special with the help of our comfortable and luxurious party buses here at Bergen Limo. 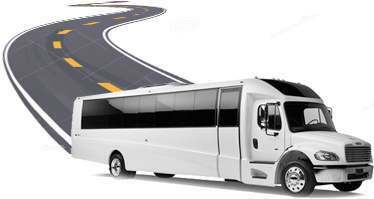 No matter where the special event in New Jersey or New York is going to be held, our Party Bus Rental packages will surely get you there in a distinct style while continuously enjoying the celebration when traveling. Drinking and driving will never be an issue when you are out for an awesome night with your friends to celebrate your special occasion. Our Hummer Transformer Package for Party Bus lets you party without thinking about the aftermath. So party as much as you want and enjoy the special occasion with your friends. Our New Jersey Party Bus Rental is perfect for many different occasions or events and can accommodate up to 50 pass on board; we offer party bus rates for 30 pass, 40 – 44 pass and 50 pass, so whether the event is your birthday, corporate outing, anniversary, prom, wedding or anything that requires a special celebration, our party bus packages will surely fit your needs. Some of the great features you can expect from our party bus are multiple televisions, fiber-optic entertainment and Hi-tech sound system. Call Bergen Limo and start your reservation for party bus to make your occasion better. Ask us about our 50 pass Party Bus NYC Package. Every day – 24/7, Bergen limo has the right vehicle to satisfy your request anywhere in NJ, NY and beyond. We service Bergen County, Essex, Middlesex, Morris County, Passaic, Somerset, Union and Sussex. Call us any time of the day and book your trip today!. Thank you for all the great service with the Limo rental this past weekend. Lee, our driver, was great. He arrived early, very professional, helpful and accommodating! Thank You for the limousine. it was great with an amazing driver. can you please send me a revised copy of my bill to include the hour of overtime. I want to thank you for your amazing service on Saturday night. James picked us up Saturday at 530 in Hawthorne NJ and was with us all night. James was awesome! He was extremely professional, pleasant, helpful, and most of all, he got us to and from our destination safe while we had a blast! Thank you for making our special night that much more fun and amazing.